The last time I tried to visit Turkey was more than 30 years ago, and my attempt failed. I’ll tell that story at the end of this post. I will tell you, though, that I finally managed to get there recently when I flew to Ankara to lead a workshop. I tacked on one extra day to look around a bit, as I often do when I travel for work. 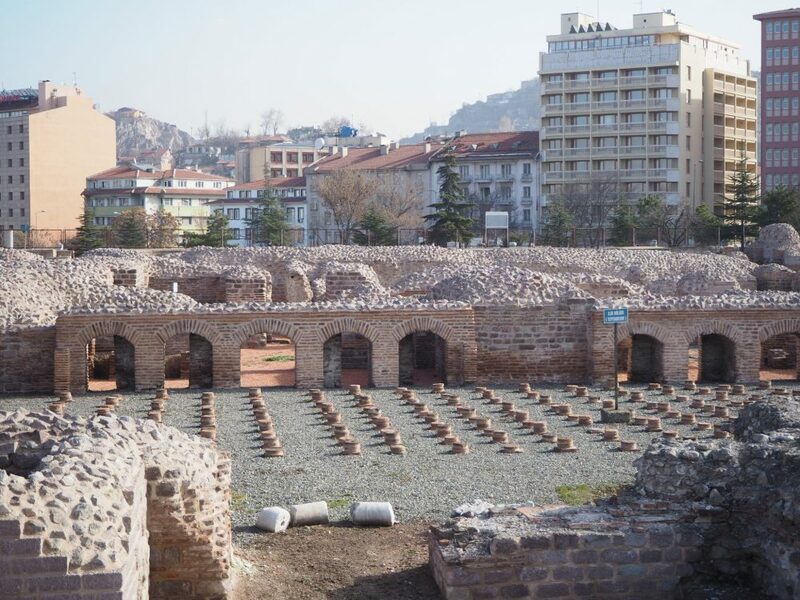 I started at Ankara’s Roman baths. 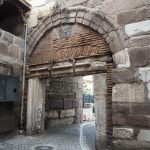 Ankara was an important crossroad between East and West in the Roman period, and the Romans did a lot of building in the 3rd century CE, though little of it remains. The baths, not far from the oldest part of the city, were among the largest in the Roman Empire. On entering and paying a fee of 5 lira (about 1 euro), I first climbed a few stairs to a large flat field. Bits of Roman art and architecture line the paths around and across the field. It reminded me of places like Greece and Israel, where bits of antiquity are so common that they end up just lying around. Often, they are pieces that would take pride of place in a US museum. This figure, about a meter tall, is unlike any of the other more sophisticated pieces scattered over the field. Perhaps it’s from an earlier period? Broken columns with ornate Corinthian ornamentation, gravestones carved with human images or epitaphs, and random architectural elements dot the field. Crossing the field took me to the baths themselves, surrounded by a wall with a walkway on top, allowing visitors to view the baths from slightly above. Moving around the ruins – but not entering them – you can see the remains of the typical features of Roman baths: a hot bath (caldarium), warm bath (tepidarium) and cold bath (frigidarium), as well as a dressing room and a pool. Small, neat piles of bricks remain: they would have held up a floor, and hot air would have circulated around them, heated elsewhere by an oven. The Roman baths are interesting in that they give an impression of how old Ankara is. 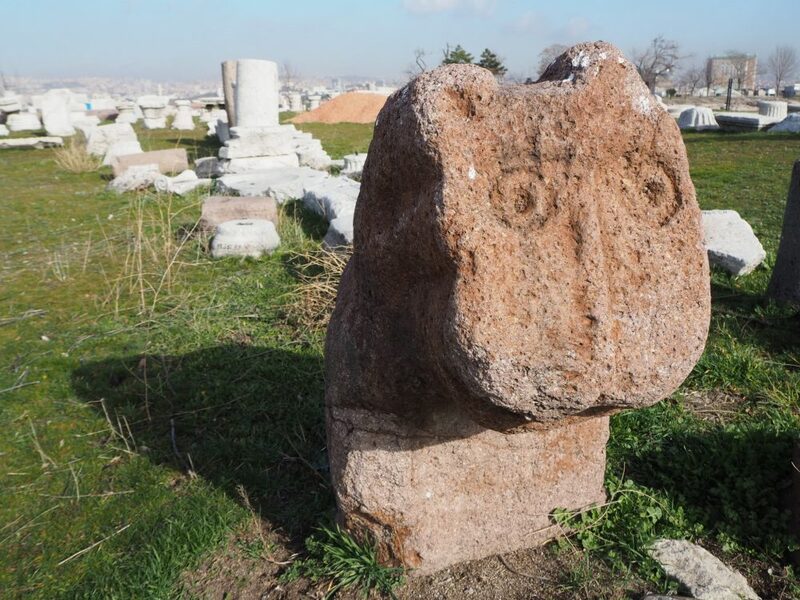 Excavations done in the 1930s, when the Turks developed Ankara to be their capital city, didn’t only find Roman ruins. The Romans built on older civilizations, including the Phrygians, dating to a thousand or more years earlier. I list these two together because they appear to be literally attached to each other. Again this reminded me of Israel – Jerusalem in particular – where structures and beliefs have both literally and figuratively intertwined. If you are a strong walker, it is probably not a problem to walk from the Roman baths to the mosque and temple. I didn’t, because a massive construction project cut off the most direct route. Instead I took a taxi, which only took about three minutes (5 lira, or about 1 euro, though the driver tried to get me to pay 20 lira or 5 euros) to reach a pedestrian street about a block or so from the mosque. Hacı Bayram mosque. The small section under the minaret is the mausoleum, and looks older than the rest. Hacı Bayram mosque dates to the 15th century. In Ulus, the oldest part of the city, it has a wide plaza on one side and fountains on another. When I visited on a Friday morning, many people – locals, not tourists – were enjoying the weak February sun on the plaza. The fountains weren’t working, and men were rolling out mats on the plaza, presumably readying the space for overflow from the mosque. The entrances to the plaza were blocked off and guards checked everyone by patting them down or scanning them with handheld metal detectors. When I asked a guard – female, and without a headscarf – whether I needed a headscarf, she just shrugged. Seeing that all the women on the plaza had headscarves on, I put mine on too. Removing my shoes outside, I entered the small mausoleum part of the mosque, just under the minaret. The tomb of Hacı Bayram-ı Veli, a Sufi spiritual leader, fills most of the tiny room. Men and women prayed either standing or kneeling. The ceiling has some pretty detailing, but I didn’t feel comfortable pulling out my camera and taking pictures in the midst of all of those praying people. I also didn’t feel comfortable trying to enter the main part of the mosque, so I don’t know what the rules are. I suspect male tourists would be allowed in, while women probably could only enter a separate women’s section. Side wall of the Temple of Augustus and Rome. You can see the minaret from the mosque just behind it. The Temple of Augustus and Rome next door is much older: first built in the 1st century, it was rebuilt in the 2nd century and later turned into a church in the 6th century. Unfortunately, there doesn’t seem to be a way in, so I was only able to see it from the outside. The marble sides, I assume, are Roman, while the alternating rows of black and reddish-brown stone were probably part of the Byzantine remodeling. 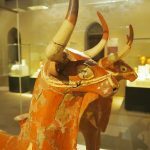 If you like ancient ruins, you might also like Knossos and the Minoan Mystery, Susita National Park in the Golan Heights, or Visiting the City of David: Older than the Old City of Jerusalem. I could see Ankara Castle high on a nearby hill from near the mosque, but didn’t fancy walking down into the valley between and then up to the castle, so again I took a taxi. It took about 10 minutes and cost about 2-3 euros. The imposing entrance to Ankara Castle has two squat, rounded towers flanking it. What drew my attention, though, was the blocks making up those towers. 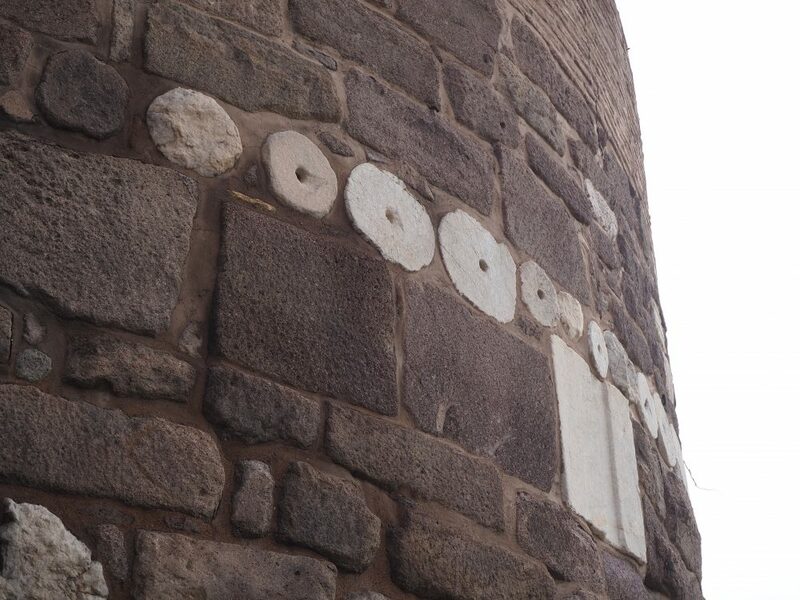 Evidently, the builders of the 7th -9th century were thrifty, and not inclined to waste all the perfectly good masonry lying around. 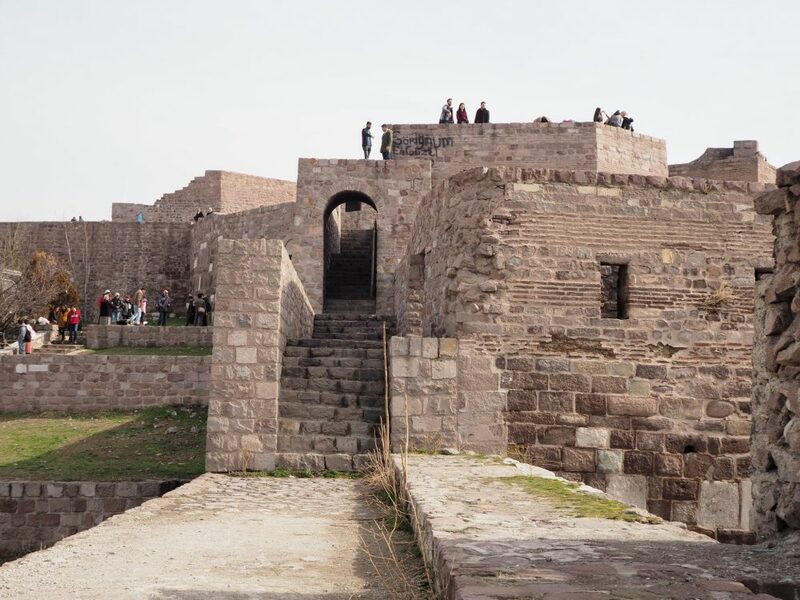 The structure, mostly composed of dark stone blocks, is dotted with marble pieces, clearly recycled from the earlier Roman castle that used to top the hill. These builders were probably renovating earlier versions of the castle, though it’s not at all clear how far back the hill was fortified. Bits of Roman building materials used in later fortifications at Ankara castle. 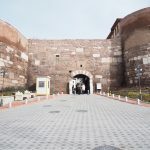 In any case, Ankara Castle isn’t really a castle; it’s a fortified hilltop, and only the walls remain. Through the main gateway you enter an area of narrow pedestrian streets lined with gift shops and restaurants. These are interesting old buildings, many made of wood frames filled with brick and mud, with clay tile roofs. A short walk takes you to the inner walls of the castle on the peak of the hill. The inner castle walls have not been modified in any way for safety. When I was there, a group of Japanese tourists, and a smattering of locals as well, were climbing and walking the walls like mountain goats, something I didn’t dare to do. The tops of the walls are uneven in places, without guard rails, and I just didn’t feel graceful enough to take the risk. Some of the inner walls of Ankara Castle. Nevertheless, from the areas where I felt safe, I could see over the roofs of the older houses nearby to the rather hazy skyline of the modern city beyond. It must be stunning at sunset, but I still had other sightseeing in Ankara to do. Hover over any of the pictures below to see their captions, or click on a picture to enlarge it. 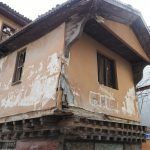 An old house, in need of repair, inside the Ankara castle walls. Lots of recycled building material in this wall! If you like castles and fortifications, try one of these: Burghausen Castle, Gripsholm Castle, Himeji Castle, or Belvoir Fortress. 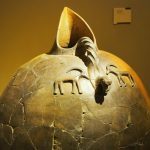 The Museum of Anatolian Civilizations is just a short walk downhill from Ankara Castle. The tree-shaded, elegant, 15th-century building was once a marketplace, and has been very effectively converted into a museum. 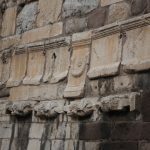 Bas-relief orthostats, which are large square stones that originally decorated the lower part of walls, line the high, domed, central hall. 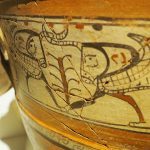 They date to the early Bronze Age and the Hittite Period, and depict, for example, battles involving the Hittites and the Egyptians, or gods and goddesses. In the halls arranged in a square around the central hall, artifacts are grouped by period and by location, spanning centuries of history. I skimmed, at this point, by just strolling the halls and letting the more striking pieces draw me in. 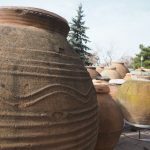 Pottery, metalworking and stone carving are all represented here, in a wide array of styles and periods. Useful items like tools and pottery stand side by side with statues and other ceremonial objects. I followed the steps downstairs to view the Greek and Roman section, where, among other things, the better finds from the excavation of the Roman baths are on display away from the elements. Outside, I strolled the grounds, where carvings of various kinds dot a sort of sculpture garden. On one side of the building is a row of Roman grave markers, beautifully carved. In the corner stands a cluster of large clay pots: the sort that cannot stand on their own. These are less decorative than many of the items inside, which I assume means they were storage pots. To do this museum justice would take a couple of hours at least. 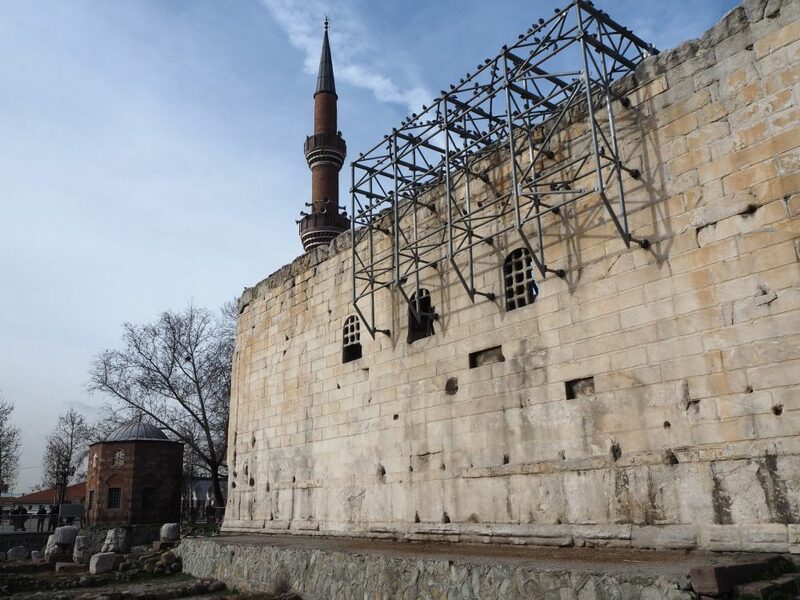 Nearby the Museum of Anatolian Civilization and the Ankara Castle, the Aslanhane Mosque is one of the oldest in Turkey, dating to the 13th century. I didn’t go inside, but it was worth stopping to admire the architecture. Like the castle, many of the stones come from earlier structures. Anitkabir is about a 15 minute drive from Ankara Castle, so I took a taxi again (about 20 lira or 5 euros). Set in a large, green parkland on a hill, this imposing building is the mausoleum of Turkey’s founding father, Mustafa Kemal Atatürk. He led the Turks in their war of independence and was the Republic’s first president. Completed in 1953, Anitkabir consists of a broad, flat, rectangular plaza, with the large, square mausoleum at one end and lower porticoes lined with pillars around the sides. Some rooms behind the porticoes contain exhibits about Atatürk. I got there just in time to see the changing of the guard, which involved some very precise goose-stepping troops, followed by a swarm of photo-snapping tourists. Once that ended, I enjoyed wandering the plaza in the evening sunlight and admiring the mausoleum itself. It surprised me that something built in the 1950s – not my favorite architectural period – could be so pleasing to look at. The mausoleum is simple but well-proportioned, and its open design is light and airy, despite its imposing size. Entering the mausoleum, I was again surprised to see that Ataturk’s tomb is quite small, placed at the back of a large, empty, central hallway, and unadorned except for a simple wreath. Tired, feet hurting from a day of walking, I decided that this would be my last stop of my one day in Ankara. I managed to see the most important sights, so I felt satisfied. 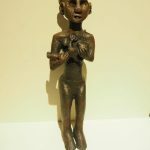 If I had had more time, I might have visited one or more of the other museums, like the archaeological museum or the industrial museum, and perhaps shopped in a market or in the old part of town. At last count, I’ve visited 60 countries. Yet, until this recent trip, I’d never been to Turkey. Why? I blame it on Midnight Express, the 1978 film recounting the story of Billy Hayes, who was arrested for drug smuggling in Turkey and spent a brutal five years in jail before he finally escaped. And I blame my mother. It was the fall of 1986 and my friend Stuart and I were traveling around Europe. Our plan was to visit Turkey on our way from Greece to Israel. My mother, though, had seen Midnight Express and was absolutely convinced that I would end up meeting the same fate as Billy Hayes. In her eyes, I looked like a hippie, and tended to dress like a hippie. I assured her I had no intention of smuggling or taking any drugs, but she rather hysterically insisted that someone could easily plant some on me or my luggage, and I’d end up in jail anyway. Amazed that my normally not-so-dictatorial mother would make a threat like that, I gave in. Stuart and I went directly from Greece to Israel, with a short stop in Cyprus. Anyway, I’ve always meant to get there – everyone who’s been to Istanbul, in particular, says it’s wonderful – but never got around to it. I still haven’t been to Istanbul, but I will. My mother might be turning in her grave, but at least I don’t look anything like a hippie anymore. I think I can risk it, don’t you? Please share this post in whatever way gets your social media juices flowing. And leave a comment below, if you have anything to add! Thank you! Roman Baths: Open daily 8:30-19:00. 5 lira (1 euro). Anafartalar Mahallesi, Çankırı Cd. No:43, 06050 Altındağ. Hacı Bayram mosque: No published hours, but it should be open all day. No charge, but make sure to ask what is or is not allowed. If you’re female, dress conservatively and wear a headscarf to enter. Remove shoes before entering. Hacı Bayram Mahallesi, 06030, Sgk-ulus Şubesi, 06030 Altındağ. The Temple of Augustus and Rome is only visible from the outside. Hacı Bayram Mahallesi, 06030, Sgk-ulus Şubesi, 06030 Altındağ, next to the mosque. Ankara Castle: Open daily 8:00-18:00. No entrance fee. Kale Mah., 06240 Altındağ. 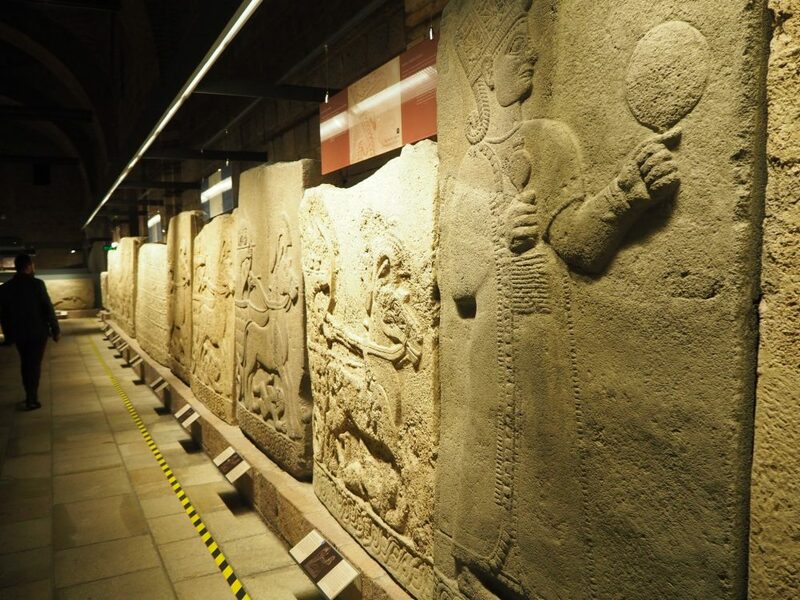 The Museum of Anatolian Civilization: Open daily 8:30-16:00. Admission: 20 lira (about 4 euros). Kale Mh., Gözcü Sk. 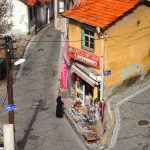 No:2, 06240 Ulus/Altındağ. 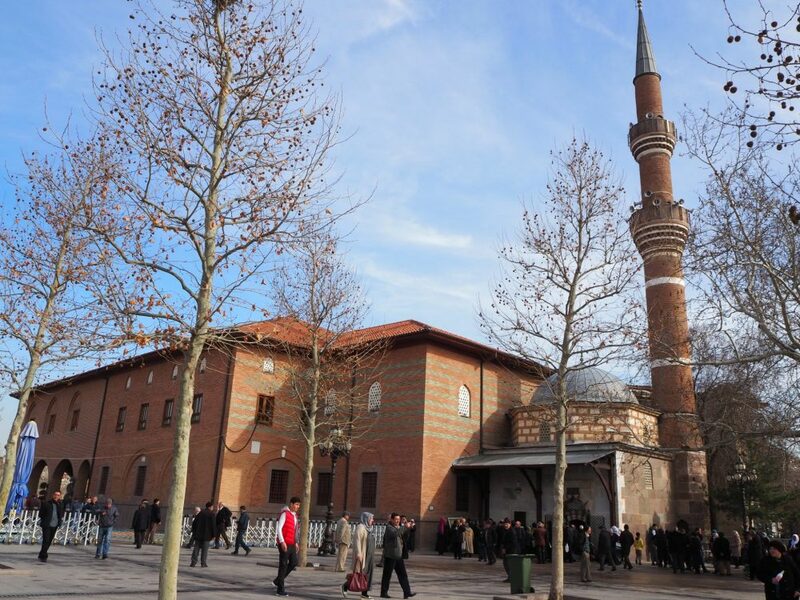 Aslanhane Mosque: No published hours, but it should be open all day. No charge, but make sure to ask what is or is not allowed. If you’re female, dress conservatively and wear a headscarf. Remove shoes before entering. Kale Mh., 06240, Kale Sk., 06250 Altındağ. Anitkabir: Open daily, but the museum rooms are closed on Mondays. No charge. Anıt Caddesi Tandoğan. I was fortunate enough to go to Istanbul for a conference when I was still working. 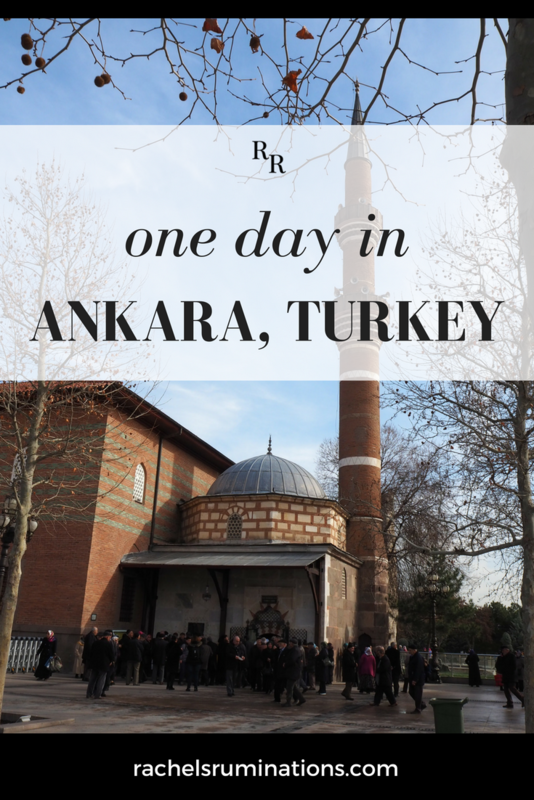 The Sofia, the Blue Mosque, and the Grand Bazaar are must-sees in one’s lifetime. And our hotel was a former castle! But I am surprised Ankara also has a lot to offer! But I also want to go back for Capadocia! 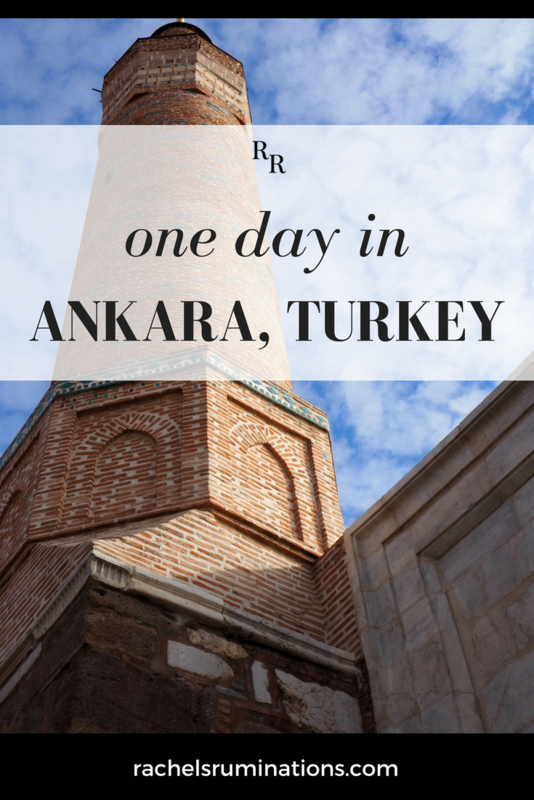 This was my first glimpse of Turkey, but Istanbul is high on my bucket list! We’ve been to Istanbul, although not for long enough, and saw Gallipoli and Cappadocia, but never got to Ankara. Which is odd since a capital is bound to have some attractions. 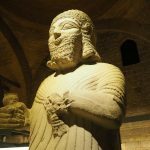 I really want to see that museum of Anatolian civilizations. And the Roman baths. I’m a complete sucker for Roman baths. When I get rich, I’m going to put one in my house. Haha, wouldn’t that be great! Though I probably wouldn’t bother with a frigidarium because I’d never use it! 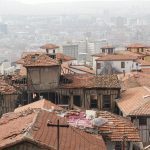 Ankara was not originally the capital and just became one in the 20th century, so it doesn’t have the same density of sites as many historical capitals have. It does, though, have excellent museums. What a wonderful walk/drive through history and interesting buildings. I would have enjoyed accompanying you. 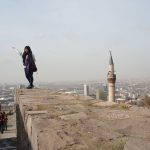 Your explanation as to why you to hadn’t been to Turkey before is a good reminder for all of us to seriously look at the preconceptions we have about places. Exactly! When I went to Kuwait a few months ago, also for a workshop, most people I mentioned it to said things like “But is it safe?” The war was years ago, but people still make decisions based on the old images. HI Rachel. I’ve not yet been to Turkey, but would love to visit. 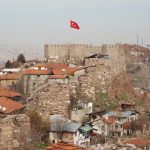 Your post about Ankara was very interesting, although I would likely head for Istanbul. I commend your mother for following her instinct and trying to protect you. Sometimes, we are travelling, and not fully aware of the threats that may be out there until someone from outside the area brings them to our attention. I know she was just trying to protect me, but she was basing it on faulty information. And yes, it sounds like Istanbul and Capadoccio are the places to see. 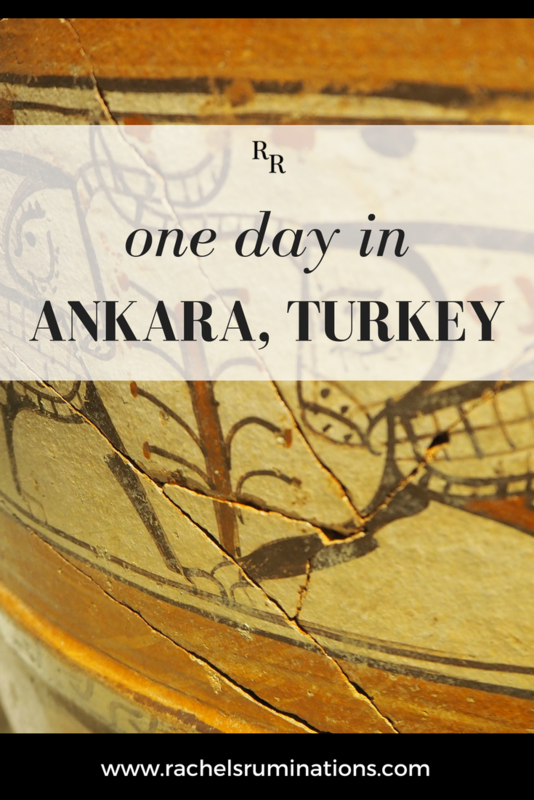 Wow, you sure packed a lot in if you did all that in one day in Ankara! I still have Turkey on my list, too, having been put off in the past due to political uprisings, bad timing with work, etc. I’ll get there one day, though. Me too! I’m definitely going to fit in a trip to Istanbul soon. Too many people have told me what a fascinating city it is! I’ve been wanting to go to Turkey for the last couple of years, but the political unrest there and in nearby Syria just scare my blonde American head too much. Ankara looks like it has so much to offer, and I hope I get there soon. I can understand not going as a political choice, but it’s not unsafe in the places tourists visit. Just don’t go near the border with Syria, and be aware of your surroundings pretty much anywhere, just as you have to be in the US. This post was enchanting! I loved the connection of stories from your being on the road 40 years ago, and not making it to Turkey alongside your travels today! And then realized it was (just) pre Midnight Express days that I travelled through Turkey – How could that be?!! I’ve been using compact cameras all along, but just got a proper one, so I’m doing my best just to notice more in general. My photography skills are definitely a long-term project of improvement! I’ve been to Istanbul (which I’d highly recommend), but not anywhere else in Turkey. I hadn’t really thought of Ankara as a place to visit but you’ve made me think again. I love the way it is such a mixture of history and cultures. 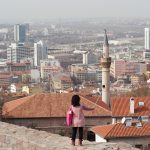 I don’t think I’d recommend going out of your way to visit Ankara, but if you’re there for some other reason, it’s worth a bit of extra time. Ankara is the capital city of Turkey and the second largest city in the country after Istanbul. We are visited there with my friends. We got many fun there. Because this place is full of enjoyment. The Ankara Castle, Aslanhane Mosque, Anitkabir is really awesome places for any traveler. 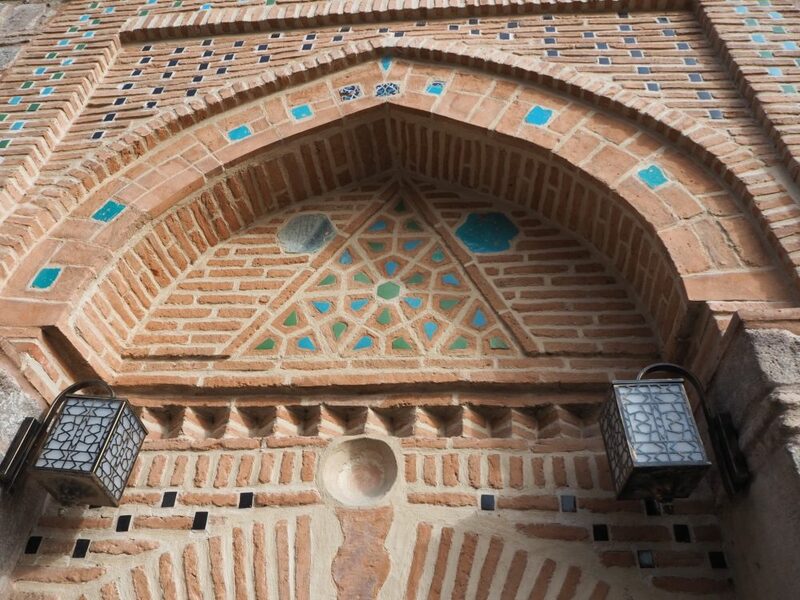 but i didn’t visit the Haci Bayram mosque so i want visit this to the next. 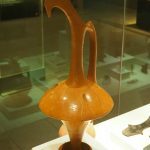 Yes, and check out the Museum of Anatolian Civilizations too; it’s quite interesting!